I had to draw this at some point. One of the most Irish symbols we've got tends to be a pint of Guinness. 'Leann' is used in a few phrases that related to ale, beer or cider. A 'teach leanna' is a phrase for a pub, while hops are 'lus an leanna'. I love the dark inking style that kicked off at the end of the 19th century like Irish artist Harry Clark, check out some of his illustrations you can see at the Crawford Gallery in Cork. I was really inspired by this style when creating this illustration. 'Gearróg' means a short bit or a scrap of something. There's no actual word for day in this phrase, so it seems to be that short dark is all that needs to be said to communicate the dark Irish winter. 'Dóite' can mean to burn something or something withered or something that's bitterly severe or fed up and bored! Its a pretty interesting word! 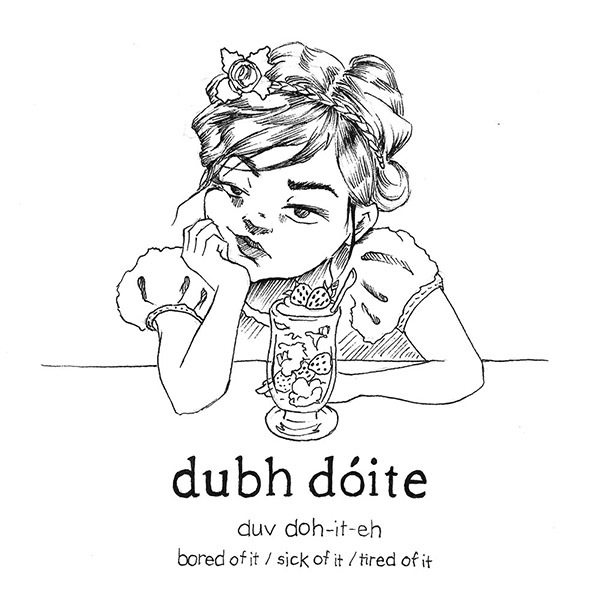 'Dubh dóite' literally sounds like burnt black, but might also be suggesting that the light or shine 'geal' that someone has is faded or gone out and that describes their boredness, but that's just a theory! I really enjoyed drawing this bored girl at a party look, shes so bored not even a strawberry parfait can make up for it! 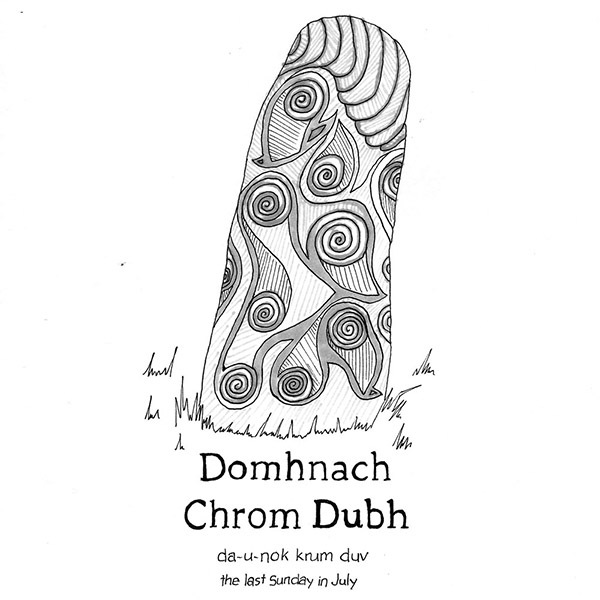 This is just my visual interpretation as 'an dubh a chur ina gheal ar dhuine' was translated a few ways on teanglann.ie mainly to pull the wool over someones eyes or to bamboozle someone. 'Geal' means something bright or light itself and many phrases about liking something or finding something good contain 'geal' in them. So literally this phrase reads like darkening someones bright or clouding someones vision.